Note the large cells with large, pale nuclei containing large purple nucleoli at the arrowheads. 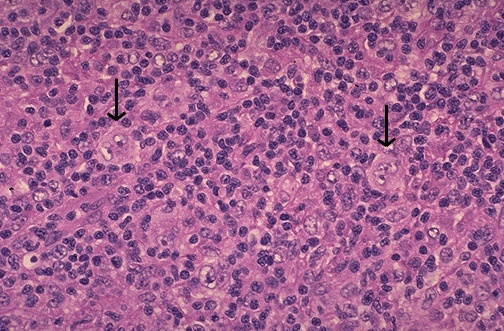 These are Reed-Sternberg cells that are indicative of Hodgkin's disease. Most of the cellular content of foci of Hodgkin lymphoma consists of reactive lymphoid cells. There are four main subtypes of classic Hodgkin lymphoma with CD15+ Reed-Sternberg cells and variants: lymphocyte rich, nodular sclerosis, mixed cellularity, and lymphocyte depletion. The lymphocyte predominance subtype with CD15- Reed-Sternberg variant cells acts more like a low-grade B-cell lymphoma.